A Greenville, South Carolina native, Janet Buchanan-Kerr made more outstanding individual contributions toward the success and national prominence of women's swimming at the University of Miami than any other Hurricane swimmer in school history. 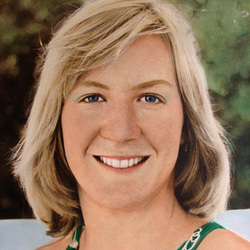 From 1975 to 1978, Buchanan earned All-American recognition in 17 events throughout her career, while leading the Hurricanes to the A.I.A.W. National Team Championships in 1975 (her freshman season) and 1976. In her inaugural performance at the national championships as a freshman, Buchanon set a school and national record in the 50 yard breaststroke with a time of 29.997. That effort marked the first time tht any woman swimmer had ever covered the 50 yard breaststroke distance in under 30 seconds. Buchanan went on to claim a total of seven individual and relay national titles, while also participating on the 200 yard medley relay team from Miami that established a new American record in 1976 along with teammates Jodie Yambor, Pat Hines, and Leesa Sward.